Thinkmap's visualization is an effective way to navigate through information, and it can be used to help in the discovery of unknown, yet important, relationships. 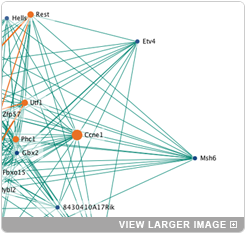 In the case of the Jackson Laboratory, where Assistant Professor Matthew Hibbs runs an effort to understand the mechanisms of abnormal cell replication seen in cancer, a Thinkmap visualization is a key tool for finding the genes that might be involved in this process. Hibbs and his team study stem cells, cells that are able to divide and differentiate into different cell types, as well as self-renew to produce more stem cells. More specifically, Hibbs is interested in the process of self-renewal, as this is a process that many scientists suspect is key to understanding how cancers form. The challenge is that although we know all of the genes in the human and mouse genome, we don't know what function most of these genes perform, or how they interact with each other to accomplish their role. Hibbs' lab combines known information from the literature with analysis derived from noisy, high-throughput experiments to determine what might be useful relationships. So a user sees, in one display, two different types of relationships. Those that we know to be true, based on classical research, and those that we're not sure of, based on inferences from over 800 different analyses used to find similarities between genes. StemSight scout is a Thinkmap-based tool for exploring these potential similarities between genes. The underlying data combines information from literature with information drawn from various experiments, so that an end user can find potential genes to further explore. 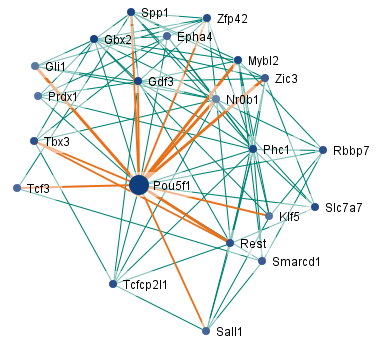 Since all the information about one gene can be shown in a graph, an end user can quickly drill down to a few potential candidates for exploration. These genes can then be further examined in the lab, thus allowing for more efficient experimentation. The gene Pou5f1 is well known for its importance in the self-renewal process. The orange lines represent connections that are known from the literature. The green lines represent connections that are inferred from experimentation. A scientist looking at this display might decide to investigate gene Gbx2, to see if it too has importance in the self-renewal process. "We're really happy with the Thinkmap tool, and how quickly we could get this application built and up for use," says Assistant Professor Hibbs. "Already we're discovering some very promising paths for research and exploration." Since StemSight is public, other researchers can access the data as well, increasing the likelihood that a solution will be found. The Thinkmap visualization helps researchers find information that would be difficult to discover without the visualization. Due to Thinkmap's flexibility, Hibbs' team was able to develop a tool that is improving our understanding of stem cells and the process of self-renewal.